If you are like most people, you have imperfectly shaped eyeballs. Minor imperfections in the shape of your eye can cause the vision problem known as astigmatism. Almost everybody has astigmatism to some degree but many do not realize they have an eye problem because the imperfections are so minor. Other people with astigmatism suffer severely blurred vision. Fortunately, your optometrist can correct your astigmatism and restore your vision. When you look at something, light rays from that object travel into your eye and onto your retina, which is light-sensitive tissue lining the back of your eyeball. Cells in your retina transform the light rays into electrical pulses, which your brain then translates into the images you perceive. The light rays must hit a precise spot on the retinas for the images to be clear. Corneas are the transparent membranes covering the outside of your eyes. Together with the lenses of your eyes, your corneas help focus light rays onto the retinas for clear images. A healthy cornea has a mostly round shape that focuses light properly. A cornea with astigmatism has an oblong shape that projects light rays onto the wrong part of the retina, resulting in blurred vision. Most people are born with astigmatism but the condition tends to worsen with age. Injury, illness and eye surgery can also cause blurred vision associated with astigmatism. One medical condition known as keratoconus causes the cornea to take on a cone shape. The most common symptom of astigmatism is blurred vision but this condition can also cause headaches and eyestrain. Sensitivity to light, seeing distorted images and difficulty seeing contrast may occur. The optometrists at Maple Ridge Eye Care can accurately diagnose and treat astigmatism. 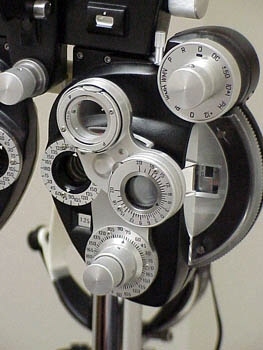 First, your optometrist will perform a comprehensive eye exam. This includes a visual acuity test to measure how far you can see clearly, keratometry to assess the curvature of your cornea, and refraction to determine how well your eyes focus. Your optometrist uses these tests to determine if you have astigmatism. Your optometrists at Maple Ridge Eye Care can recommend treatment to reduce astigmatism or its effects. The most common treatment is prescription eyeglasses that have special lenses to compensate for the irregular shape of your eye. Soft contact lenses can also reduce the symptoms of astigmatism but, since soft lenses conform to the shape of your eye, may allow corneas to continue losing their shape. Gas permeable lenses maintain their shape on the eye in a way that compensates for irregularities in the shape of your cornea. Eye surgeries known as photorefractive keratectomy (PRK) and laser in situ keratomileusis (LASIK) permanently change the shape of your corneas to provide long-lasting relief from astigmatism. Make an appointment with Maple Ridge Eye Care to learn if you have astigmatism and to discover clearer vision through treatment for this common vision problem.